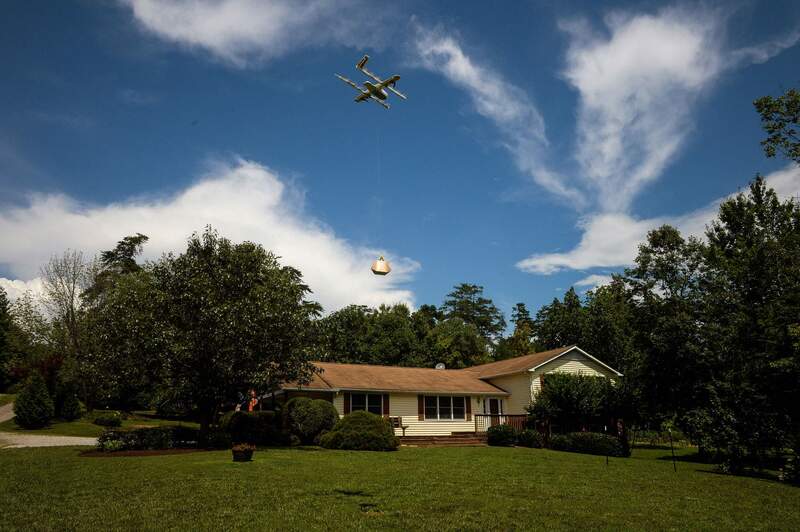 Alphabet Inc.’s Wing drone delivers a package in Blacksburg, Va., on Wednesday. WASHINGTON – From her home in a wooded hollow in Virginia hill country, Brianna Smith and her 2-year-old son Jack entered the aviation record books on Tuesday. Just six minutes after a technician from Alphabet Inc.’s Wing clicked the “Confirm Order” button on a smartphone app, a drone operated by the company had flown from a simulated store more than a mile away, hovered over her lawn and lowered the ice cream and Popsicle she’d ordered. “Airplane brought me a Popsicle,” said Jack. The Smiths were part of a Federal Aviation Administration-approved test that for the first time allowed flights over congested areas where people live, and ventured beyond the view of its operator on the ground. It was the most realistic public demonstration to date in the U.S. that people may someday get near instant purchases sent to their home by unmanned devices. “Today, we’re going to see what I’ve been preaching, how drones are going to change your daily experience,” said Mark Blanks, director of the Virginia Tech Mid-Atlantic Aviation Partnership and a sponsor of the test program. The delivery was to his next-door neighbor. The demonstration in Blacksburg was conducted under the U.S. government’s Integration Pilot Program, which was unveiled last May. The Department of Transportation selected 10 government and tribal agencies to work with industry and academia to push the boundaries of drone technology at the same time that they wrestle with potential public unease and legal questions. Widespread deliveries are likely still years away and scores of issues – ranging from ensuring drones won’t be used in terrorism, as apparently occurred last week in an assassination attempt in Venezuela, to creating a new low-level air-traffic system – must be completed first. But both Wing and the retail behemoth Amazon’s Prime Air have conducted similar tests in other nations. Nevertheless, Tuesday’s demonstration was a milestone in the U.S. The flights were novel for how many different types of technology were being tested at once, said Chief Executive Officer James Ryan Burgess. In addition to the technology needed to guide the drone to its drop zones, the company demonstrated a radio-identification beacon, which is similar to what the government plans to mandate soon. It also relied on an existing cellular network for communication and was tracked by a kind of air-traffic system it hopes to introduce. The “purchases” were made on mobile phones using an app it wants people to eventually use to buy items from real vendors. “It’s an exciting opportunity to build a whole ecosystem,” Burgess said. During his talk to about 50 government officials, participants and media members in the open field that served as a launching spot for the drones, he joked that he could order sunscreen if anyone wanted it. Wing last month became an independent subsidiary of Alphabet. It was born under what was originally known as Google X, the division designed to spawn so-called moon shots of new ideas. While technology giants Alphabet and Amazon have been in the forefront of trying to develop large-scale drone delivery systems, a host of smaller start-ups also are developing similar technologies. Flirtey Inc., for example, plans to deliver defibrillators by drone in a test in Reno, Nevada. Some of those companies have been conducting FAA-tests behind closed doors, so it’s not always clear how advanced they are. As important as the technology and safety issues are, officials are just as interested in how local residents will react to the drone flights. Blanks said he and his staff knocked on the doors of 30 to 40 homes in the area to ensure that no one was surprised. He also gave presentations to the local government agencies. “I’ve gotten literally zero negative feedback,” Blanks said. Chris Tuck, chairman of the local Montgomery County Board of Supervisors, said a handful of his constituents had expressed concerns, but overall, the government and local residents were excited that the area has become a test bed for the new technology. During a preview of the delivery, Tuck asked Wing’s Burgess whether the aircraft would be capturing any video recordings that might threaten people’s privacy. While the device known as the Hummingbird V2 has cameras to ensure it can descend without hitting a parked car or a tree, the remote operator never sees it and it’s not stored anywhere, Burgess said. The latest Wing tests are the result of tens of thousands of experimental flights of various drone models in recent years, including a 2016 demonstration also at Virginia Tech to haul burritos to hungry volunteers. The company has also done extensive work in rural Australia, using its drones to deliver dog treats and candy bars to farmers. Flights outside the vision of an operator on the ground and over humans are not permitted under current U.S. regulations. Project Wing received a waiver from the FAA to perform the flights, the first one for deliveries. The Wing drone is a hybrid aircraft, kind of a miniature cousin to the military’s Osprey. Part helicopter and part fixed-wing airplane, it can take off vertically and also fly longer distances with improved efficiency over traditional copter drones. It has 12 rotors for lifting it vertically and two forward-facing propellers for horizontal flight. It has a top speed of 85 miles an hour and covered the distance to Smith’s house in about one minute. Instead of landing and dropping off its cargo on the ground or a rooftop, the Wing drone hovers over a delivery site, its engines buzzing in a high-pitched whine, and lowers the items on a thin tether. That way, it avoids the potential hazards of striking people or objects on the ground. As Jack fussed in the background – the drone tests had made him late for his nap – Smith said it was amazing to see the drone deliveries up close.